It’s not all over the mainstream news media yet, but it will be. Comet PanSTARRS will start showing up in the Western Horizon around dusk starting March 7th. This is likely to be quite an observing event if you have the opportunity to view it. Here is an image from Jim Gif and was taken March 3rd in Australia. 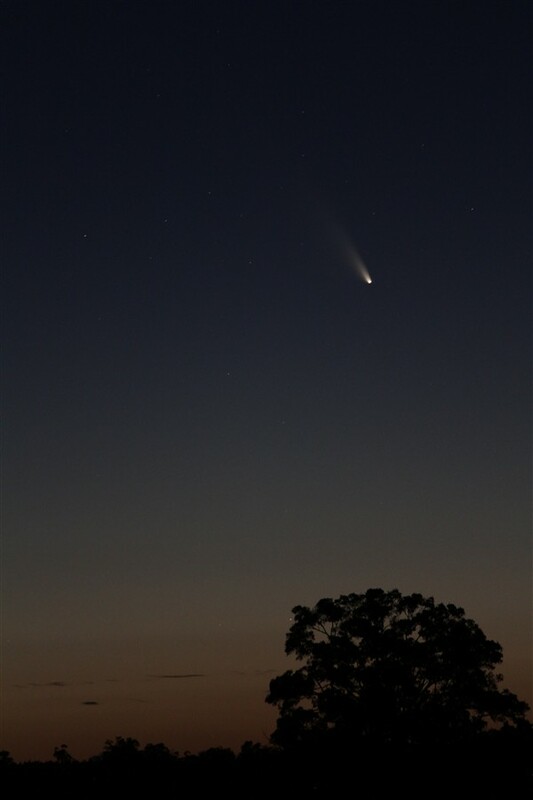 Comet PanSTARRS as imaged by Jim Gif in Australia on 3/3/2012. Now this comet will continue to brighten, and shortly will become an object to observe in the Northern Hemisphere. This transition occurs roughly around March 7th, and if you have a really good view of the low horizon (no hills), you will likely be able to see it. I plan on posting some ideas for locations to observe from as it gets closer to March 7/8. Here’s an image from Sky & Telescope magazine (visit their Comet PanSTARRS Page for great coverage) that gives an idea of the location of the comet as the month progresses. Any pair of decent binoculars will be the best of observing tools for viewing this comet. Sky & Telescope Image of PanSTARRS location in the sky through the month of March. Again note how low the comet is in the Western Horizon at the start of the month. You will need a good clear view of the horizon to see the comet at dusk. The KAS will be supporting the Kopernik Observatory & Science Center in any observing opportunities that will be possible as the month progresses. KAS Members – if you are interested in observing opportunities and road trips to view the comet please contact kas’at’kopernikastro.org for more information. This entry was posted in Astronomy & Observing, Events and tagged comet, comet PanSTARRS. Bookmark the permalink.